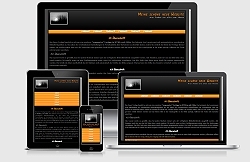 Modern webdesign is more and more characterized by the ability to be displayed nicely on every medium, be it desktop computer or smartphone. The first layouts that were used when internet was still young, were well adapted for desktop computers, which already had different display resolutions but still in a limited range. Nowadays the requirements are more complex which tears the layman's hair and you probably ask how this requirement can be fulfilled? 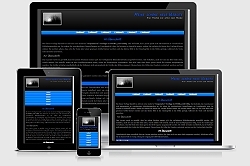 The answer is quite simple: responsive webdesign is the solution! Modern webdesign uses HTML5 and CSS3 as a basis which offers a big variety of possibilities to build responsive code. 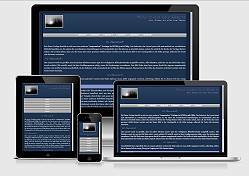 "Responsive" means that the layout kind of reacts to the medium used to see the website. 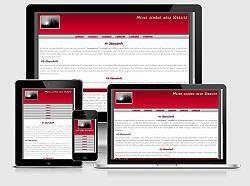 On this page you find a number of responsive website templates that fulfill this requirement. You can test them by just shrinking the window of your browser. At a certain point you will see that the layout jumps to a different arrangement, which still looks attractive on e.g. a tablet or smartphone. 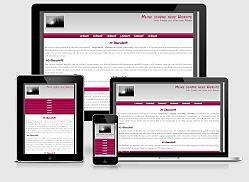 All templates on this page are based on the same template, just the colours have been changed in the style.css-file. 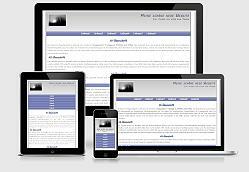 Responsive Website Template with a total width of 95% of the display resolution. The example photo is the only graphical element in this template. all other effects, like e.g. shadow have been done by CSS technique.